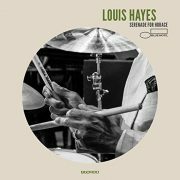 Louis Hayes: "Serenade for Horace"
Had Louis Hayes merely taken a leisurely stroll down memory lane in paying tribute to his former boss, Horace Silver, that would have been perfectly fine. The 80-year-old drummer, who joined Silver’s legendary quintet when he was 19, has durable Silver classics such as “Señor Blues” (from his first album with the pianist, 6 Pieces of Silver) in his DNA. But on his first album as a leader for Blue Note, where Horace made history, Hayes has no use for hard-bop nostalgia. Leading a terrific quintet including vibraphonist Steve Nelson, he leaves his own imprint on the songs even as he honors their composer. Nelson’s presence is key: With the notable exception of his underrated 1973 album In Pursuit of the 27th Man, Silver never featured vibes. In addition to adding a sparkling, hard-swinging dimension to this collection, Nelson shares focus with pianist David Bryant—and perhaps takes some pressure off as well. One of two rising stars in the band, the other being pungent-toned trumpeter Josh Evans, Bryant brings an understated soulfulness to the proceedings. Gutty tenor saxophonist Abraham Burton and bassist (and co-producer, with Don Was) Dezron Douglas complete the group. As relaxed as the music gets—“Strollin’” and “Summer in Central Park” are lovely lessons in how to sustain intensity in a sotto voce mode—Hayes still has plenty of energy to burn. He’s a powerhouse on “Hastings Street,” a new original dedicated to his hometown of Detroit. But his greatness owes more to his remarkable time feel and ability to ride a melody. The one misstep here is “Song for My Father.” Guest vocalist Gregory Porter is in fine, laidback form, but his banal lyrics, however heartfelt, defile one of Silver’s most beloved tunes.